Clutter! 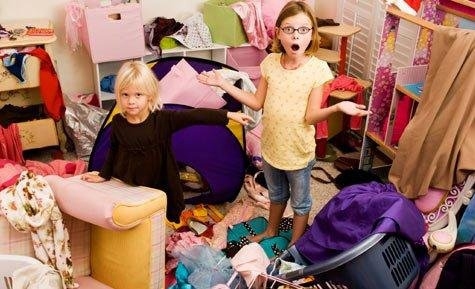 Every mum struggles to keep it at bay, and most would admit that five minutes before visitors arrive, all manner of junk is being quickly stowed in the nearest room with a closeable door. Here are some simple ways to keep the clutter under control, even with a large family or limited space. If you've got a spare hand, grab something that doesn't belong and put it in its place. You'll be surprised how many things get put away if you follow this simple step. Try counting how many times you leave a room each day. Follow the ‘one in, one out' rule. The biggest cause of clutter is that mums, dads and kids keep bringing new things home when they simply don't have a place for them. Make it a family rule that if one new thing is brought home to stay, one old thing must go. The kids may feel the sting a little less if you encourage them to give their old possessions to someone less fortunate. Why not teach them good household habits, and the art of generosity as well? It stands to reason that large items take up a lot of space and add to the general clutter in the home. Ensure your larger items such as the ironing board and highchair have a home when not in use. And put them there! Most families have an abundance of clothing because it is such a popular kids' gift from friends and family. Follow the ‘one in, one out' rule and be sure to get rid of an old item of clothing for each new item you add to your wardrobe. Another fun tip is to hold a yearly ‘fashion show' - try on each item of clothing and decide whether to keep it or get rid of it. The kids will find this lots of fun and mums can see exactly what clothing is too small or beyond repair. Clutterbusting tip 5 - Paperwork be gone! Deal with paperwork as soon as you open it. Mail, bills, catalogues, school notes and receipts - it all piles up so quickly! To cut down on the confusion with paperwork, try to sort mail as soon as it arrives - it's much easier to deal with in small doses. Keep a simple system of clearly-labelled folders for easy filing. Do the same with your email inbox - a daily cleanout will ensure you never have to deal with that annoying ‘mailbox is full' message again. Invest in good shelving and storage solutions, but remember - more storage equals more stuff. In particular, ensure each child has suitable storage in their bedrooms for their personal possessions, including clothes. When their personal space is filled, go by the rule of ‘one in, one out' - whenever they bring something new home to keep, something old has to go. It's amazing how much tidier the house (and the kids rooms) will be when all their stuff has a place to live. Take 5 minutes to clear the kitchen bench and table before bed. You'll feel much better in the mornings if you wake to find a tidy kitchen. A quick tidy-up of these two key areas of the home can help your morning stress levels, because you won't be surrounded by clutter during that busy breakfast and school rush. Mums are the world experts on multi-tasking, and this can cause a lot of distraction! It's a common habit for busy mums to plonk an object down where we last used it, mostly because we're doing so many things at once. Get into the habit of putting things away as soon as you're done, and you'll cut down on a great deal of the clutter in one simple step. You might be surprised just how much you can achieve when you put yourself on the clock. Set the oven timer for 20 minutes, choose an area, and clean, clean, clean! You can even join the 20 Minute Speed Cleaning mums group on Kidspot Social for some inspiration, and you just might find a sprint-buddy to clean with while you're there. Server responsed at: 04/24/2019 5:56 p.m.